The first is one I picked up in a class I took years ago at Central Sewing Machines in Edmonton, called Heirloom Sewing, I think. We did all kinds of cool practice with double-needles, cutwork, and specialty threads and needles. The thicker threads, such as Sulky Blendables, especially in the 12 weight, are beautiful to quilt with, especially for a simple allover stipple, as they really add tactile texture. They do not work well for quilting motifs that require backtracking simply because of their heavier weight. The tip is to use a Topstitch 90 needle when you sew, and to back your top tension off a little, not much. Play with it on a test piece to get it right. You will love the results. 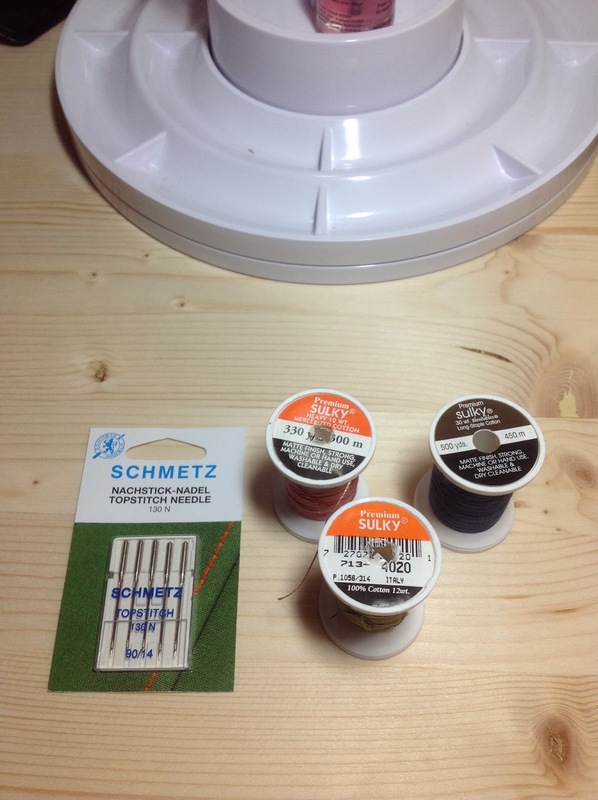 I prefer Schmetz needles. Here you see the heavy 12-weight Sulky, which I used on the front of my Frenchy bag, as well as a spool of 30-weight. Both are wonderful, and the nuances in colour are truly spectacular. Ha! A tip inside a tip: you can often get these at JoAnn on sale, or with a 50% off coupon! The second Aha! Moment tip is one I discovered myself. I had to put it into action last night, sigh. After I took the close-up picture of the inside of my Frenchy bag, I saw a dark line at the bottom of the lining. Looked closer...nooo!! I had not sewn far enough in to cover up the stay-stitching and basting during construction. I could not leave it; it was already driving me nuts knowing it was there. I know, I know, it probably would be covered up by the junk I'll be stuffing in the bag, but nope, couldn't leave it. So I reverse-sewed the bottom last night, and then first thing this morning pinned very carefully, and resewed it. 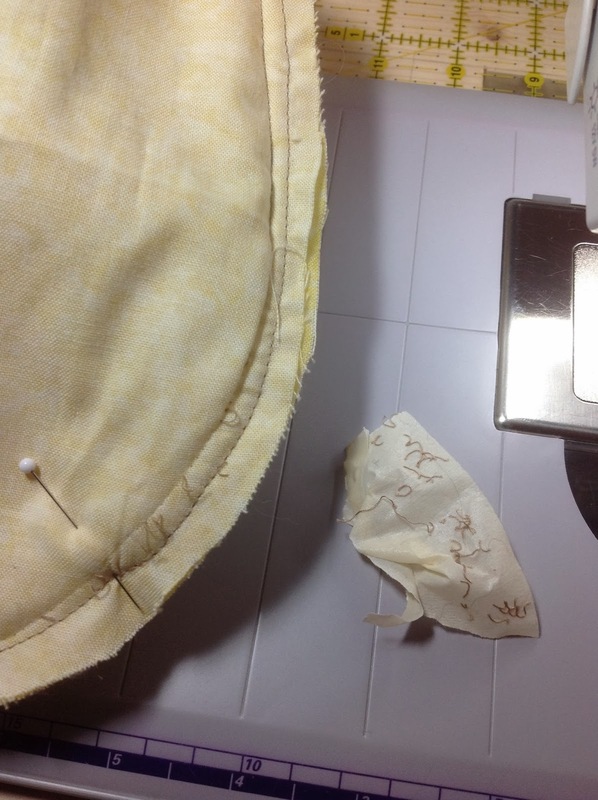 When ripping out a seam, aka reverse sewing, LOL, to pick out those remaining pesky little threads before you resew, use a piece of masking tape or even a lint brush, and dab or roll across the ripped seam. The little threads will easily get pulled out! So much faster than picking them with your fingers, or trying to pick them out from the front side after you re-sewed the seam and they're caught in it!! Yup, been there, done that. And, another Aha! Moment tip: to reverse sew more quickly, slide your seam ripper under every 3rd or 4th stitch on one side of the seam. Flip to the unripped side, and pick out an opposing stitch. Pull. You will have one long continuous thread easily pulling out on that side, and a lot of the little threads from the other side will come with it! Use the masking tape method to pull out an remaining pesky ones.